Hey guys. 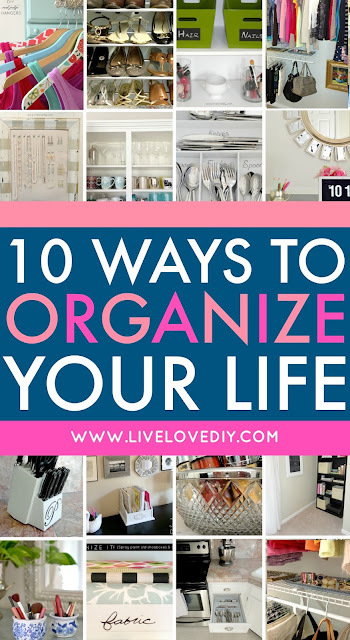 So, today I'm sharing how I organize our entire house on a budget. 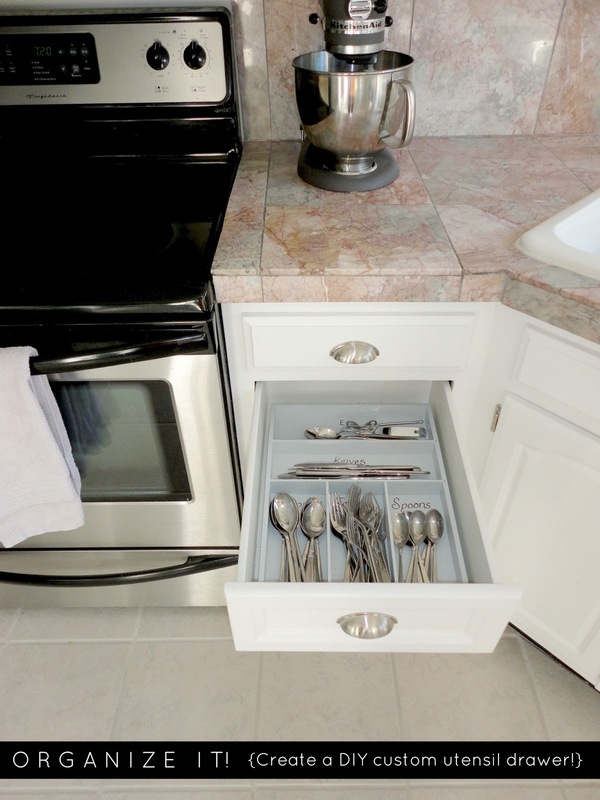 These ideas don't require that you run out and buy a million containers and just add to the clutter. Instead, most of these ideas involve repurposing things you already have and actually reducing the clutter around your home. Because who doesn't love the feeling of being organized and saving money? #1. 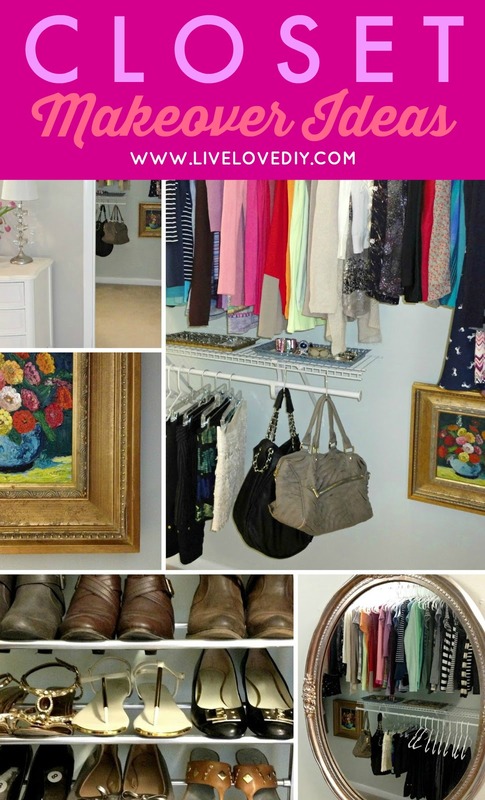 Organize your closet with stuff you already have. For about $50, I organized our entire closet. It involved a little aqua wall paint, some silver spray paint (on a junky old shoe rack), and some vintage mirrored trays (found at a thrift store). #2. 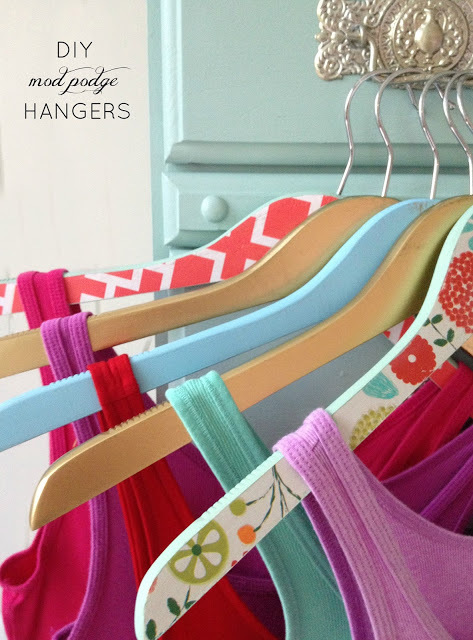 Upgrade your hangers with some mod podge and spray paint. #3. Hang your pots and pans. We have a tiny little kitchen, so I try really hard to maximize every square inch. 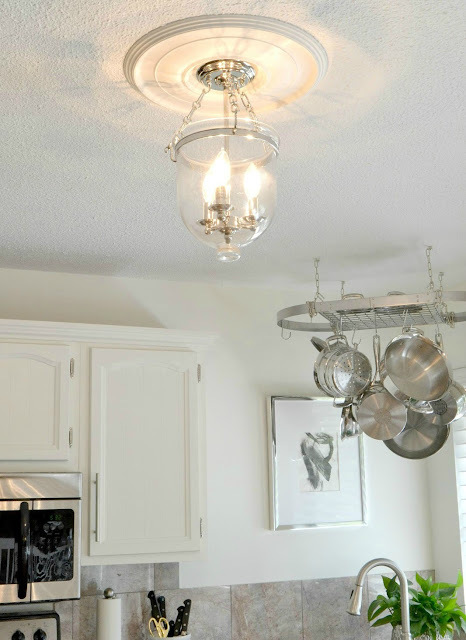 One of the ways I did this was by hanging a pot rack from the ceiling so that our pots and pans didn't take up our limited cabinet space. #4. Upgrade your outdated kitchen gear with some paint. 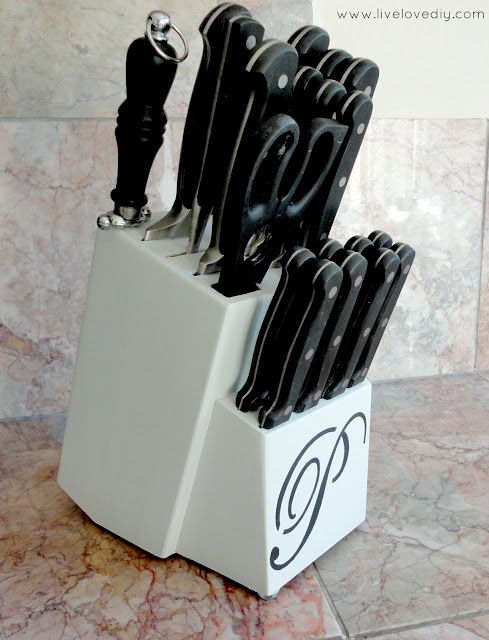 And our old wooden knife block. All it took was some blue paint and a stencil of our initial. #5. 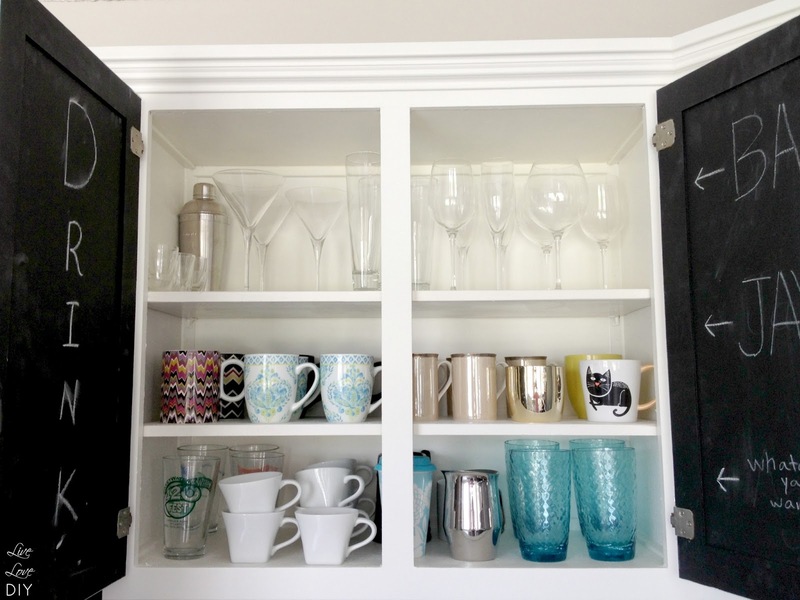 Paint the interiors of your kitchen cabinet doors with some chalkboard paint. 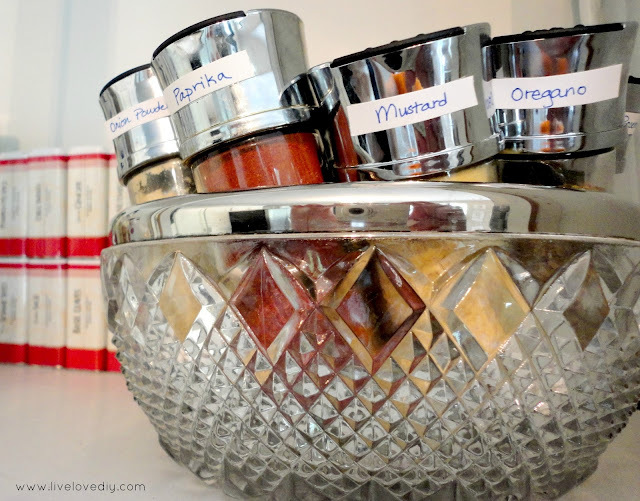 I used some basic glass spice jars, made my own labels, and stuck them in a crystal bowl I found at the thrift store. #7. Organize your beauty products. In one of our linen closets, I use some dollar store bins (that I painted labels on with chalkboard paint) to organize my extra beauty products. 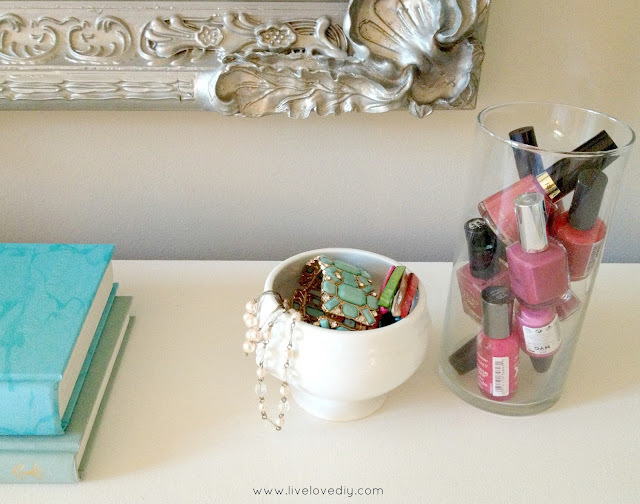 I use some simple dollar store vases to house nail polish. 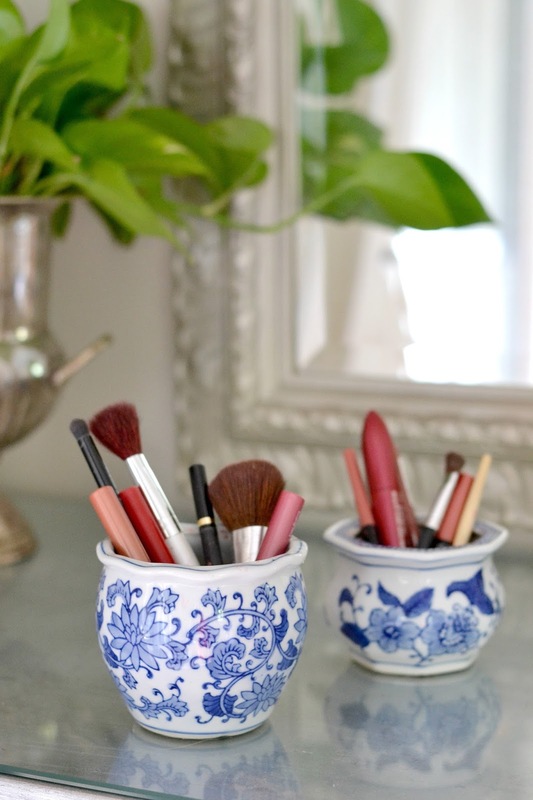 And I use some thrift store bowls to store my makeup on my vanity table. #8. Make your own jewelry organizer. I took the frame from an old mirror, taped it off with some painter's tape, and spray painted some stripes on it. Then, I added a corkboard to the back, some nailheads, and created my own jewelry organizer. 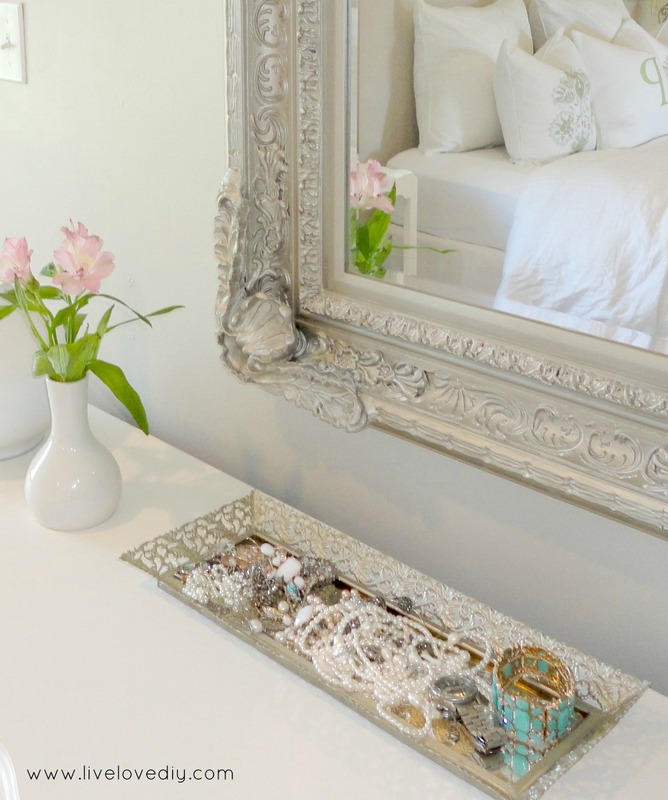 And when I don't feel like hanging my jewelry up, I just toss it on a mirrored tray I found at the thrift store. #9. 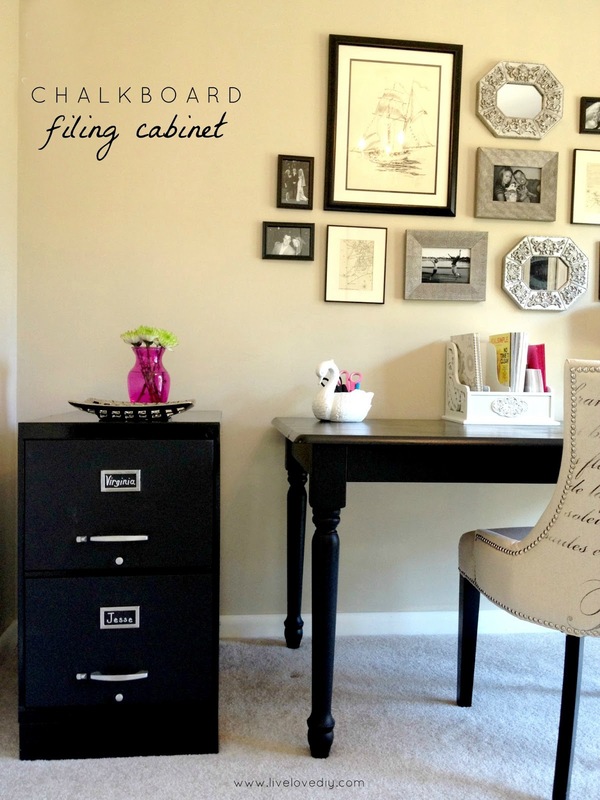 Update an old filing cabinet with spray paint. I found an old filing cabinet on the side of the road, spray painted it glossy black and added some chalkboard labels. I also use random containers to house my pens, like the spray painted duck (above) and the gold thrift store mug (below). 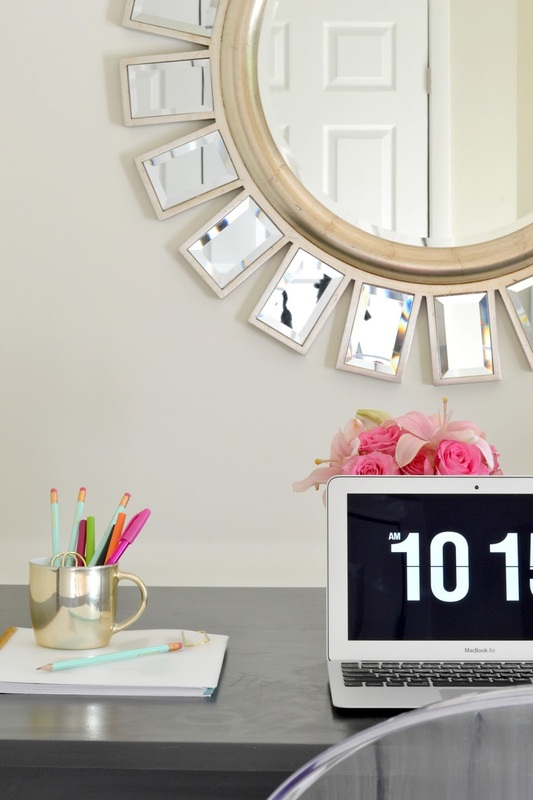 Take the office tour here. #10. 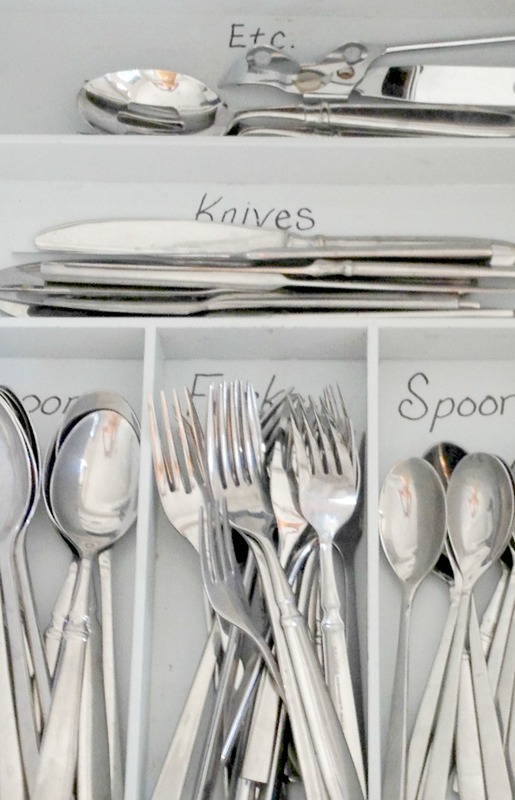 Organize your fabric in a shoebox. I have tons of fabric remnants from redoing old chairs and making pillows, etc. I fold the remnants over a piece of cardboard and store them in old shoe boxes that I've spray painted white and labeled with a sharpie. And those are my top 10 ways I keep our house organize for cheap! Thanks for being here, ya'll. Hope you found something somewhere in this post that will help you save a little money and make life a little easier! P.S. 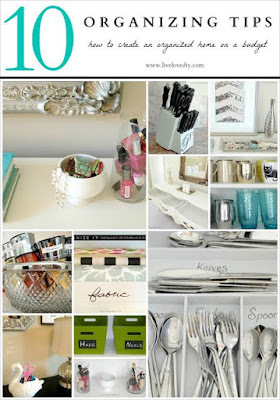 For more great ideas, check out my top 50 budget decorating ideas here. This is an epic roundup. Will you PLEASE come organize my house? I do most of this...but I'm not very good with my clothes. I have tried to maximize my space but bottom line is there just isn't enough room! Great tips...awesome post as always! You are phenomenal. No kidding! Come to my house, please!?!? I would pay you well. :) I'm going to steal some of your fabulous ideas for sure. Thanks ~ I'm pinning these ones for later. I love the blue grey paint you used maybe its because it has my surname in its name! Hehehehe! Great tip and ideas keep blogging love it!